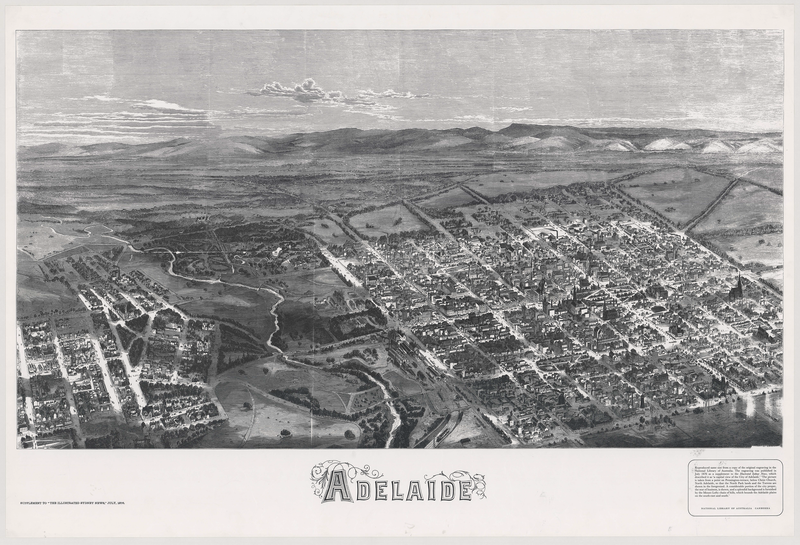 In July 1876, the Illustrated Sydney News published a special supplement that included an early aerial view of the City of Adelaide, the River Torrens and portion of North Adelaide from a point on Pennington Terrace, North Adelaide. 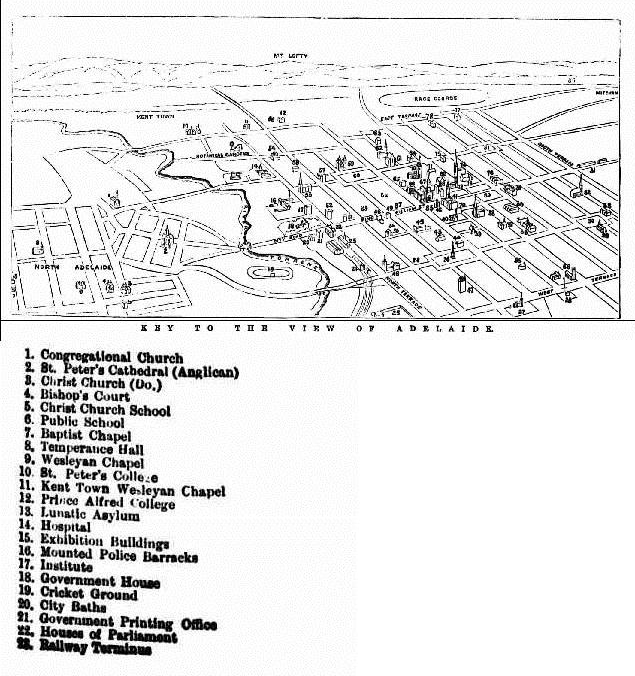 Although the map is not drawn to scale, the detail and oblique drawing technique give a fascinating impression of what Adelaide was like in the 1870s. Many of the roads leading in and out of the city were little more than tracks. Businesses were concentrated along King William Street north of Victoria Square. The city still contained patches of open space, especially south of Victoria square. The layout of the Botanic Gardens and attached Botanic Park were evident by 1876. Row cottages housing workers and their families were concentrated in the southern and western portions of the city. The mansions of the wealthy clustered in the east and across the River Torrens in North Adelaide. Identify particular sites using the key below. Jude Elton, History Trust of South Australia, ‘Adelaide 1876’, Adelaidia, History Trust of South Australia, http://adelaidia.sa.gov.au/panoramas/adelaide-1876, accessed 21 April 2019. Hi, i have a 1000x700 framed print. I was wondering how many of these might be around as I acquired mine from my partner who found it in a second hand shop and I grew up with one exactly the same on the wall in my parents house. Wouldn't it be funny if it was their old one..
Hi Steven, it's hard to say for sure how many survive. The one shown here is held by the State Library of South Australia, but as it was printed in the 'Illustrated Sydney News' there would have been quite a few created initially. I'm not sure exactly how many were printed Steven, but given it was in the Illustrated News there's a fair chance a few copies are in existence still. Our digital copy comes via the State Library of South Australia. how can i buy a copy of this sketch? Hi Kirstie, I've sent you an e-mail with the details of how to apply to the State Library of South Australia who hold this image. I would also be keen to find out how to get a copy of this print. Thank you!